How is art defined and classified? What's the difference between fine, decorative and applied arts? What's the difference between arts and crafts? What's the difference between representational and abstract art? What are aesthetics? What are ready-mades? What is junk art? For answers to these and other questions see: Definition and Meaning of Art. For Christian diptychs, triptychs and polyptych altarpieces, Eastern Orthodox icons, and illuminated gospel manuscripts, see: Christian art. For all artworks derived from the Old or New Testament of the Bible, see: Biblical art. For a guide to sacred artworks in general, see: Religious art. For more information about print techniques such as woodcuts, relief or intaglio processes, aquatint, mezzotint, etching, dry-point, engraving or lithography, stencils, serigraphy and silkscreen, see Printmaking. Other forms of art covered include various types of painting and drawing, as well as animation, architecture, assemblage, calligraphy, caricature, ceramics, collage, conceptualism, digital computer art, graffiti, graphic art, illustration, installations, performance, metalwork, mosaics, photography, pottery, sculpture, sketching, stained glass, tapestry, textile design, video, numerous types of artistic design, and more.  For more information, see Types of Art.  For answers to popular questions, see: Art Questions. Read biographies of ALL the great European Old Masters, such as: Gothic illuminators like Jean Pucelle and the Limbourg Brothers; leading icon panel painters like Theophanes the Greek and Andrei Rublev; Sienese painters such as Duccio di Buoninsegna; Flemish masters like Jan Van Eyck, Roger Van der Weyden, Hans Memling; Dutch painters like Hieronymus Bosch, as well as early German artists like Albrecht Altdorfer, Durer and Holbein. We analyze the Greatest Renaissance Paintings by Giotto, Masaccio, Botticelli, Leonardo Da Vinci, Correggio, Raphael and Tintoretto. We profile Mannerists like Paolo Veronese, miniaturists like Nicholas Hilliard, the Bolognese School of Annibale Carracci, and the great masters of Baroque painting such as Rubens, Caravaggio, Velazquez, as well as Ribera's Neapolitan School, and illusionist fresco painters like Pietro da Cortona and Andrea Pozzo. We profile Dutch Realists like Rembrandt and Jan Vermeer; as well as 18th century view-painters like Canaletto, Rococo painters like Boucher and Fragonard; Neoclassicists such as Jacques-Louis David, and Romantics like Goya.  For a chronological list of painters by movement, see: OLD MASTERS.  For a combined list of painters and sculptors, see: Visual Artists: Greatest. LOOKING FOR DETAILS OF A PARTICULAR ARTIST? We profile ALL the great 18th century masters of English figurative painting, like William Hogarth and Joshua Reynolds, as well as ALL the main members of the school of English landscape painting including JMW Turner, Constable and Richard Parkes Bonington. We also cover the 18th century American School, exemplified by portraitists Benjamin West, John Singleton Copley, and Gilbert Stuart, and Japanese Ukiyo-e artists, like Hokusai and Hiroshige. We provide biographies of ALL major 19th century painters including: masters from the French Barbizon Landscape School, like Corot, Theodore Rousseau, Millet and Daubigny, as well as American painters of the Hudson River School (Thomas Cole, Frederic Church), and exponents of Luminism. Realists like Daumier and Courbet, and Symbolists like Gustave Moreau, are also covered. We profile ALL the great Impressionist painters and ALL Post-Impressionist painters like Georges Seurat, Van Gogh, Gauguin, Cezanne and Munch. We profile Jules Cheret, inventor of 3-stone chromolithography, as well as ALL the great Russian artists up to 1917, including the goldsmith Peter Carl Faberge, creator of the exquisite Faberge Easter Eggs.  For narrative, historical or mythological works, see: Best History Painters.  For individual, group or self portraits, see: Best Portrait Artists.  For views and vistas, see: Best Landscape Artists. We profile ALL major 20th century painters, including Fauvists like Matisse and Andre Derain; Expressionists like Modersohn-Becker, Kandinsky, Emil Nolde, August Macke and Klee; Chagall and Modigliani of the Paris School; Cubists like Picasso and Braque; Dadaists like Marcel Duchamp; Surrealists like Dali and Magritte, and abstract painters like Mondrian, Malevich and Moholy-Nagy. We cover ALL important American artists such as Hopper, Rothko, De Kooning, Pollock, Warhol, Jasper Johns, and the Neo-Pop sculptor Jeff Koons, as well as Mexican Muralists like Diego Rivera, and South Americans like Fernando Botero, and 20th century European masters like Lucian Freud, Antoni Tapies, Yves Klein and Damien Hirst. Our coverage of Prehistoric art features the oldest art from across the globe. Dating to the lower Paleolithic era of the Stone Age between 290,000 and 700,000 BCE, it includes the strange phenomenon of cupules, the Venuses of Berekhat Ram and Tan-Tan, and the Blombos Cave petroglyphs. In addition, we feature Venus figurines (Venus of Hohle Fels, Venus of Willendorf), an extensive series of articles on cave art - including cave paintings at Chauvet, Lascaux and Altamira, ivory carvings like the Lion Man of Hohlenstein Stadel, as well as ancient pottery, Australian Aboriginal X-ray and Bradshaw paintings. See: Prehistoric Art Timeline. WANT TO KNOW ABOUT STONE AGE ART? We explore a range of Ancient art from a variety of civilizations. Beginning with Mesopotamian art (c.4500 BCE onwards), it includes the sculpture and frescos of Classical Antiquity, notably those of Greek art and Roman art. For the history of Asian art and culture, see Chinese Art Timeline (c.18,000 BCE - present). From 450 CE, we cover the mosaics and religious icons of the Byzantine era, followed by the courtly revivals of the Carolingian and Ottonian dynasties. We also take a close look at Pre-Columbian Art (c.1200 BCE - 1535 CE). From 1,000 CE, we trace the development of Medieval architecture and sculpture through the Romanesque, and Gothic periods, while painting is explored through the Sienese School and International Gothic styles. We explain the difference between trecento, quattrocento and cinquecento paintings. At the same time, Italian Renaissance art receives in-depth coverage, as does 17th century Baroque art, and 18th century Neoclassical art. In addition, we also look at the history of crafts, like jewellery and fine furniture. Our guide to Modern Art lists all the trends and schools of the modern period. Important styles explored include: Impressionism (1874-84), Post-Impressionism (1880-1900), Fauvism (1905-7), Expressionism (1905-14), Cubism (1908-14), Surrealism (1923-present) and Pop art (1960s). We explain the meaning of styles like 'realism' and 'naturalism' in painting. In addition, we profile important 20th-century groups like Die Brucke and Der Blaue Reiter, and examine the contribution of styles like Japonism and Biomorphic Abstraction, as well as modern movements like Art Informel, Colour-Field Painting, Op Art and Fluxus, and the latest contemporary art forms like Angel and Fantasy art.  For more details, see: History of Art. or Art Movements. WANT TO KNOW THE DATE OF A PARTICULAR MOVEMENT? Like his father, Willem van de Velde, the Elder (1611-93), the younger Van de Velde specialized in marine painting, and the two men frequently worked closely together. It is often difficult to tell their drawings apart, although in the paintings the son's style differs fundamentally from that of the father. Van de Velde's early marine paintings, now in Kassel Museum and dating from 1653, show the influence of Simon de Vlieger with whom he was apprenticed. The wide extended seascape rises over a calm, monochrome rhythm of keels, sails and masts. Towards 1660 Van de Velde began to paint other motifs - the water, waves and small boats - with more subtlety. At the same time his composition became more complex. The vessels ceased to be incidentals and became the focal point of the painting, often placed in the foreground in the centre of the picture. This new concept may have been inspired by Jan van de Cappelle, his elder by ten years, whose influence is felt above all in those paintings that evoke the serenity of the sea in calm water ("Two Small Dutch Vessels Inshore in Calm", 1661, National Gallery, London; "Calm Sea", Musee Conde, Chantilly). Van de Velde's talent had many aspects, and he was expert, too, at depicting the excitement of fast sailing-vessels swept before a storm. His best works are spontaneous and full of vigour, capturing nature in a most lifelike manner; but when the paintings are examined closely it is apparent that the effects have been achieved with a most delicate technique. Until 1672 father and son worked in Amsterdam, but the war and subsequent economic crisis brought about their departure for England where they received many commissions. In 1674 King Charles II granted them a pension. The two painters specialized in scenes of naval battles, which they drew from a small boat, often in the very thick of action and in great danger. The composition of these paintings was often very overburdened, the accent being placed on the decorative effect, and, at the end of this English period, the execution had become rather more careless. To judge Van de Velde's painting objectively, account must be taken of the popularity of his work, especially in England. He also had many imitators who used his signature or his monogram. Of his enormous output there are important collections today in London, at the National Gallery and the Wallace Collection, and in the Rijksmuseum, the Kassel Museum, and the Mauritshuis. Van de Velde the Younger is acknowledged as the father of English marine painting. Other Dutch landscape artists of the 17th century who painted watery scenes of rivers and canals, include Aelbert Cuyp (1620-91), Jacob Van Ruisdael (1628-82) and Meindert Hobbema (1638-1709). For more about the 17th century Golden Age of Dutch painting, as well as a wide range of in-depth articles on Dutch Realism, please use our easy MAIN A-Z INDEX. Our coverage of fine art painting centres on the medium of oil painting, but we also answer questions about the earlier encaustic and tempera methods. Nineteenth century watercolours / gouache, and twentieth century acrylic paints are also covered, as is figure painting and drawing from life. Our section on colour in painting traces exactly how the main colour pigments evolved, and outlines the theory of colour, as well as the main colour palettes from Antiquity onwards. We look at the history and development of oil paint as it expanded from damper areas of Northern Europe to Italy and Spain, and also examine methods such as buon fresco and mezzo-fresco murals, and linear perspective. Painterly methods like chiaroscuro, tenebrism, and impasto are also examined, as are automatic painting techniques like frottage and decalcomania. We profile the five painting genres which make up the Hierarchy of the Genres as were taught in the main Fine Arts Academies of Europe. They are (in order of importance): (1) History Painting; (2) Portraiture; (3) Genre Painting; (4) Landscapes; (5) Still Life. We cover the origins, history and development of sculpture in bronze, stone, marble, bronze, clay, and wood. Read our introduction Greek Sculpture Made Simple covering the Archaic (600-500), Classical (500-323) and Hellenistic (c.323-27 BCE) eras; read about the great Roman narrative reliefs like Trajan's Column. We also profile the finest Greek sculptors, like Phidias, Polykleitos, Myron, Lysippos and Praxiteles, as well as famous antique sculptures like the Altar of Zeus at Pergamon, the Venus de Milo, Lacoon and His Sons, and the Ara Pacis Augustae, in Rome. For a chronological outline of the plastic arts, see: Sculpture History. In addition, we cover column statues and other architectural stonework by the great stone-masons and bronze-workers associated with Italian Renaissance sculpture, as well as Medieval, Romanesque and Gothic sculpture. We look at equestrian statues, bas-relief and haut-relief sculptures by artists like Lorenzo Ghiberti, Donatello, and Andrea del Verrocchio, along with marbles and bronzes by carvers like Michelangelo, Bernini, Antonio Canova and Rodin. We also profile great 20th century masters such as Brancusi, Ossip Zadkine, Alexander Calder and Louise Bourgeois; the Cubists Archipenko and Lipchitz; exponents of biomorphic abstraction like Jean Arp and Henry Moore; expressionists like Jacob Epstein; abstract sculptors like Naum Gabo and David Smith; minimalists like Donald Judd; junk artists like Arman and Cesar Baldaccini; kinetic artists like Jean Tinguely; the surrealist Giacometti; the Pop artist Claes Oldenburg; and the contemporary sculptors Joseph Beuys, Antony Gormley, Richard Serra and Anish Kapoor.  For an article on the theory, materials and types of 3-D objects, see: Sculpture Art.  For a list of the finest works, see: Greatest Sculptures Ever (33,000 BCE - present).  For biographies of the best 3-D artists, see: Greatest Sculptors. (500 BCE - present). We cover the history of architecture from the earliest human civilizations. This includes a review of Ancient Egyptian architecture (3,000 BCE - 200 CE); as well as Greek architecture exemplified by the Parthenon (447-422), and Roman architecture, characterized by its arches, vaulting and use of concrete; the soaring arches and stained glass art of Gothic architecture, illustrated by Chartres Cathedral; Baroque architecture (17th century) exemplified by Saint Peter's Basilica (1506-1626) and the Palace of Versailles (built c.1624-98); Neoclassical architecture (18th century) as in the US Capitol, Washington DC; American architecture (1600-present); and Skyscraper architecture (1850-present), which takes us up to the 2,717-foot Burj Khalifa Dubai building in the United Arab Emirates (2010), and the 1776-foot Freedom Tower, New York, both designed by Skidmore, Owings and Merrill. Coming soon is our brand new series of biographies on the greatest architects from around the world, including: Filippo Brunelleschi, Donato Bramante, Bernini, Thomas Jefferson, Benjamin Latrobe, James Renwick, Eugene Violet-le-Duc, William Le Baron Jenney, Daniel Hudson Burnham, Dankmar Adler, Louis Sullivan, Antoni Gaudi, Walter Gropius, Mies van der Rohe, Le Corbusier, Robert Venturi, I.M.Pei, Sir Norman Foster, Eero Saarinen, Frank Gehry, Fazlur Rahman Khan and others. In addition we profile the world's greatest photographers (1880-present) involved in portraiture, fashion, landscape, street photography and photojournalism, including Ansel Adams, Richard Avedon, Henri Cartier-Bresson, Andreas Gursky, Irving Penn, Man Ray, Edward Steichen, Alfred Stieglitz, Jeff Wall, and many others. We trace the 10 stages in the history of Irish art. These include the Stone Age engravings at Newgrange; Celtic metalwork like Ardagh Chalice, Broighter Gold Torc, Petrie Crown, and Tara Brooch, as well as Christian illuminated manuscripts like the Book of Kells. In addition, we profile the cultural institutions which fostered the growth of Irish painting, such as the Royal Hibernian Academy (RHA). We also examine the current state of visual arts in Ireland, look at the architectural heritage and cultural legacy of Leinster, Connacht, Munster and Ulster, and profile organizations involved in Irish art, like the Arts Council, Culture Ireland, auctioneers including Adams, Whytes, and deVeres, plus schools like Dublin's NCAD and Cork's Crawford College of Art & Design. Our list of over 300 biographical profiles of the greatest Irish artists starts with Garret Morphy and Susanna Drury of the 17th century, and continues up until the 21st century. We look at a range of Famous Irish artists including John Lavery, Roderic O'Conor, Jack B Yeats, William Orpen, Paul Henry, Francis Bacon, William Scott, Louis le Brocquy and others. We also review artist groups like Aosdana, as well as the most exciting contemporary Irish artists, and examine the top Irish sculptors including the Surrealist F.E.McWilliam, the figurative Rowan Gillespie, the semi-abstract Edward Delaney, and others. For details, see: Irish Sculpture. We explore a wide range of different artistic mediums, methods and styles, from a variety of cultures across the globe. They include historical as well as contemporary forms of creative expression, from almost all continents. For example: see African art, for a guide to rock paintings, classical African sculpture, religious and tribal artworks. See Celtic art, for metalwork of the Hallstatt and La Tene culture, plus abstract geometric designwork. See Chinese Pottery, for porcelain, terracotta works including black-glazed pottery and various types of Celadon; for a general guide, see: Chinese art (c.1700 BCE to 2000 CE). See Egyptian art, for tomb artworks - including, panel paintings, murals, sculpture, and monumental pyramid design. See Greek Pottery, for ceramic designs including the Geometric style, Oriental Style, Black-Figure Style and Red-Figure Style. See Japanese art for a guide to Buddhist Temple art, Zen ink-painting, Yamato-e, and Ukiyo-e painting. See Russian art, for prehistoric sculpture, medieval icon-painting, and wonderful 19th century works from the Society for Itinerant Art Exhibitions. In addition, we cover colonial art from Australia and America as well as mainstream American art (c.1750-present). We also cover the primitive native art of tribal societies in Alaska, the Americas, Africa, India, as well as Oceanic artifacts from Melanesia, Polynesia, Micronesia and Australasia. We explore the collections, acquisitions and history of the world's great museums. We profile the best art museums in America, including the Museum of Fine Arts Boston, Isabella Stewart Gardner Museum, Art Institute of Chicago, Detroit Institute of Arts, Frick Collection, the Metropolitan Museum / MoMA / Samuel R Guggenheim / Whitney Museum (all in New York), the Getty Center LA, Philadelphia Museum of Art, National Gallery Washington DC, the Phillips Collection and many more. We also profile the best art museums in Europe, such as the Louvre, Musee d'Orsay, and the Pompidou Centre in Paris, the Uffizi Gallery in Florence, the Vatican Museums in Rome, the Prado Museum in Madrid, the Tate Collection / National Gallery / Victoria and Albert Museum / Saatchi Gallery (all in London), the Hermitage in St Petersburg, the Pushkin Museum and Tretyakov Gallery in Moscow, and many more. For a general guide, see: Best Art Museums. As an introductory guide for students and teachers, we provide a number of art appreciation articles, such as: Art Evaluation: How to Appreciate Art and How to Appreciate Sculpture, among others. We cover questions like "How to assess the subject matter, composition, line and shape, colour, texture and brushwork of a painting? "; "how to judge the background/context of a work? "; "how to appreciate abstract art?" and much more. See also our new series Analysis of Modern Paintings (1800-2000). In addition, we provide an extensive series of reviews of famous paintings by the greatest Old Masters. 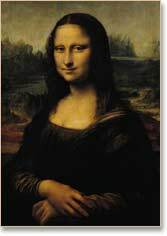 They include masterpieces from the Renaissance and Baroque periods, such as: Battle of San Romano (Paolo Uccello); Arnolfini Portrait (Jan Van Eyck); Lamentation over the Dead Christ (Andrea Mantegna); The Portinari Altarpiece (Hugo Van Der Goes); The Last Supper and Mona Lisa (Leonardo); School of Athens and Sistine Madonna (Raphael); The Isenheim Altarpiece (Matthias Grunewald); the Sistine Chapel frescoes (Michelangelo); Assumption of the Virgin (Titian); Hunters in the Snow (Pieter Bruegel); Supper at Emmaus (Caravaggio); Night Watch and Anatomy Lesson of Dr. Nicolaes Tulp (Rembrandt); Girl with a Pearl Earring (Jan Vermeer), Pilgrimage to Cythera (Jean-Antoine Watteau); and many others. For details, see: Famous Paintings: Analysis and Interpretation. Look out for our new articles on painting techniques like, foreshortening, trompe l'oeil, linear perspective, quadratura, sfumato, and grisaille. Also look out for our forthcoming series on fine art photography, as well as 20th century design, featuring decorative styles like Art Nouveau, Art Deco and Bauhaus, as well as 21st century fantasy graphics. © Copyright visual-arts-cork.com 2019 All rights reserved.